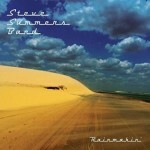 Share the post "Album review: STEVE SUMMERS – Rainmakin’"
Steve Summer is a veteran studio guitarist with an enduring love for the niche British rock/blues market. ‘Rainmakin’ is strong on riffs, bursting solos, well crafted material and exuberantly played covers, that will appeal to any self respecting rock/blues fan. He’s a master guitarist with a delicate touch, a full range of tones and an ability to express a full gamut of moods and emotions at the touch of his fingers. There’s elements of Clapton (‘The High Cost Of Lovin’), Gary Moore (the blues ballad ‘Comfort Me Baby’), Robin Trower (‘I Can’t Wait Much Longer’) and traces of Peter Green and Snowy White, on an album that fits the late 60′s British blues-rock mould, but also adds some covers by his favourite American blues and fusion artists. ‘Rainmakin’ impresses with a judicious mix of classic retro influences, diverse material and rich production values that give the album a contemporary feel. He’s at his best on the melodic ‘Rainmaker’, on which he soars above a tight production. You can feel the pull of his experience, his natural elation, the sheer energy and real feel of a track that towers over the album like a beacon. ‘Rainmakin’ flows mellifluously as the title track slips into a superb version of Steely Dan’s ‘Pretzel Logic’ – complete with a different band – on which Steve’s effortless guitar playing rises above the ensemble’s intricate interplay, to solo with real authority. It’s a great example of a consummate guitar player looking for new challenge, which he nails with real style. If there’s a downside, its simply that he’s an adequate singer who is occasionally prone to overextending his vibrato. He does so on the shaky opening vocal of ‘Mean Mistreater’ and on ‘Second Hand Blues’, a song which otherwise has real drive, an uplifting bridge and ripping guitar that that will surely make it a live favourite. The album is shot through with tasteful playing and refreshing precision, as evidenced by the variety of his attack which keeps the listener wanting more. The essential balance between song craft and musicality is to be found on ‘Comfort Me Baby’ which he attacks with gusto. He leaves plenty of space for organist Vic Martin and own expressive solo, which is an object lesson in dynamics. The song’s subtle tension is resolved by his ability to convey emotion though a conversational style solo. He adds ethereal volume swells over Bob Pearce’s subtle percussive pattern, on the atmospheric and close-to-the-mic vocal of ’In The Still Of The Night. The Vic Martin co-write brings notable variety and a new feel to the album. The music cleverly reflects a lyrical love letter and is topped by another stellar Summers solo, big on tone and dripping with real feel. The opening riff driven, ‘Mean Mistreater’ sets the standard for an album that showcases Steve’s heavy duty guitar chops, as his solo builds the number to its concluding crescendo. The wah-wah driven ‘Tears Roll Down’ is a notable highlight. The rock solid rhythm section pushes him towards a repeated harmony-laden hook resolution that stays in the memory. ‘I Should’ve Known Better’ is another riff driven rock/blues outing on which he cleverly switches from a mixed back shrill guitar tone to a sharply contrasting rhythm guitar part, before a sweeping organ and some nuanced bv’s lead to a brusque defining second solo with a much fuller tone. He attacks the fiery ‘The High Cost Of Lovin’ with a gnawing guitar tone alongside Vic Martin’s organs fills, but struggles slightly with his phrasing, while he transforms Robin Trower and Frankie Miller’s ’I Cant Wait Much Longer’ to his own ends, as his vocal rises to the occasion to mirror the line: “Everyday gets stronger”. He evokes Trower’s growling tone on an weighty finale to an impressive album that will have you hitting the repeat button. This entry was posted in ALBUM REVIEWS, ALBUM REVIEWS (Mobile), All Posts and tagged blues, Bob Pearce, Eric Clapton, Frankie Miller, Gary Moore, guitar, Peter Green, Rainmakin', review, Robin Trower, rock, Snowy White, Steely Dan, Steve Summers, Vic Martin. Bookmark the permalink.